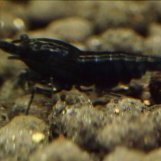 Has any progress been made in figuring out how to keep riffle larvae alive? From what I've read here and elsewhere, it's not entirely clear whether it's an issue of chemistry/hardness or food. This is a basic but important question, and I think it's easily answered by running a few experiments using water drawn from a creek where they naturally occur. Need help identifying problem. Bacterial infection? I have been having a slow die off of my CRS over the last few of months. I am fairly new to this so I am not sure how to deal with this. I started with 12 juvenile shrimp that I bought off a breeder in February this year. I started off using tap water (treated) with no problems. I got my first two berried females at the beginning of May. To this point I had had no deaths. At the beginning of June I had a couple (2) of deaths that I am still not sure the cause of. GH was low (2) at this time as I hadn't been testing for it, so that may have been the cause. Following those deaths I got some shrimp specific gh booster (saltyshrimp mineral GH+) and things seemed to recover. Berried females' eggs hatched at the beginning of June. One female became berried again in July. Now the tank was a bit overgrown at this stage so it was hard to keep tabs on the shrimp. I didn't notice any more deaths until a recent move. Before moving the tank I removed a lot of the overgrown plants. Once getting it to the new place I only saw 6 shrimp (2 females, 4 male) so it seems there were a few lost between June and August. There was one small shrimp in there as well (seems the only baby who survived). Since the move there was one death shortly after getting the tank set up. I chalked this one up to stress from the move. I haven't seen the baby shrimp since the second or so day after the move so I suspect that it has died as well. More recently I had a female die (at least I think it asa female). See the first picture below. I noticed one day that she was behaving strangely. My shrimp haven't gone up to ride the floating frogbit since the first month I had them but a few days ago I noticed one up there. I went and had a look and she was just standing there. I also noticed that she seemed to be missing her long antennae. I snapped the below photo and went to work. When I got home, she was still there in the exact same spot. A few hours later, she was on the ground lying on her side. I poked at her and it was clear she was almost dead. Once I was sure she was dead, I removed her immediately. I did a test of the water and all parameters were good except pH which was high (around 7.2). Seems my buffered substrate had run out of buffering capacity due to the use of high PH tap water. I added some fresh substrate and did a water change with RO water and the pH is back to 6.5. Water change was done over the course of the day 1 litre at a time to avoid rapid swings in parameters. My berried female was still doing well and her eggs hatched two days ago. She was active and seemed healthy the next day. Today I noticed her in the corner tipped over and not moving much. I snapped the below photo. I know the colour of the internal organs are meant to be a sign of bacterial infection, but I don't know what to really look for in a CRS. The colour in the second photo below looks odd to me. All limbs and antennae intact. EDIT: Just checked and the shrimp is dead. Anything I can do to try to determine the cause before I dispose of it? I am just at a loss at this stage. I feel like a bad shrimp keeper and I don't know what else to do. Does this look/sound like a bacterial infection to you? What can I do to fix this? Thanks for your help and let me know if you need any more info!